August is turning into a surprisingly hectic and busy month around here. I’ve got 4 new designs on the needles (some of which you’ve seen before, some of which you haven’t). 2 designs waiting in the wings to be re-knit out of commercial yarn, and 2 other designs waiting to be cast on for the first time. I’ve also got a back log of pattern to write up, and publish. And as always there are shows and school, complete with solid deadlines, to work on. Moving to what’s on the needles, why don’t we start with the “new” stuff. While this is technically a re-knit, the original was a Christmas gift for a friend’s mother so I don’t have it anymore. This scarf is primarily a simple lace design flanked by two cables on either side, and decreases to a point at either end. 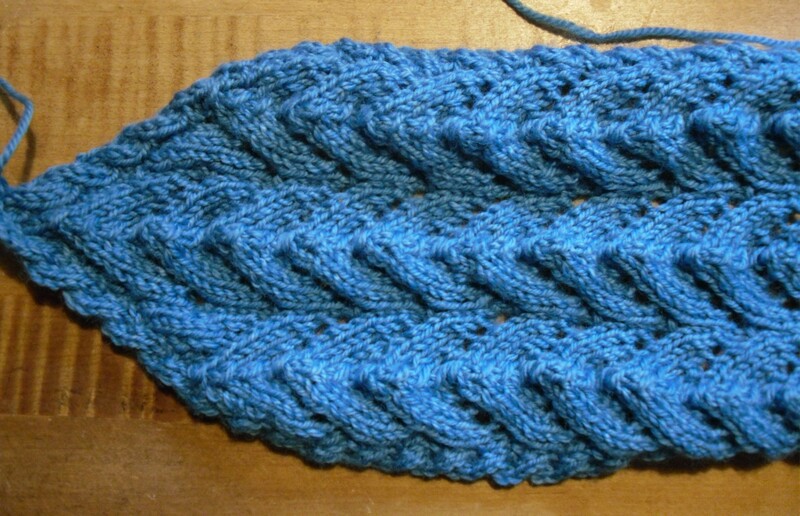 In order to make the points to be symmetrical, a provisional cast on is used and then the scarf is worked from the center out. Currently being called A Goosey Gaggle, I’d love alternative name suggestions. Due to the heat and humidity I’ve kind of put this project on hold until the humidity drops (or I can take over one of the two rooms with air conditioning), because the yarn currently feels sticky and prickly while I’m working with it, and this is entirely due to the heat and humidity. I finished the get well shawl for my relative, and I’m hoping to get it blocked some time this week, Thursday evening, maybe Friday. This is a re-working of that slap dash design, into something with cleaner lines, smoother yarn, smaller needles (not by much), and two sizes. 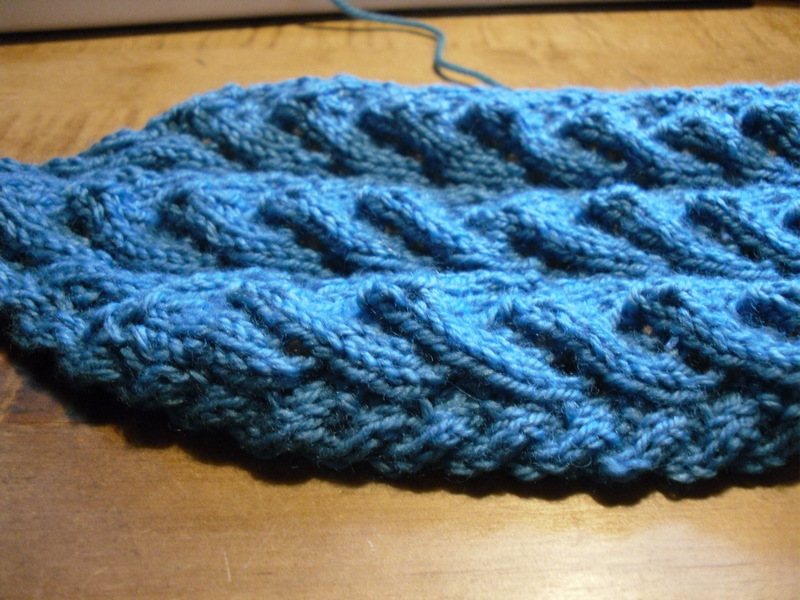 Named Bloody Waves, and being knit out of 100% rayon-bamboo, I’m having some issues with the second ball of yarn. It almost looks and feels like the yarn has been damaged by the sun, but that is based on what I’ve seen of sun damaged books and other cellulose based fabrics. My SiG baby blankie is in the home stretch, I’m knitting frantically on the border, racing neck and neck with my test knitters. I’m hoping to put in a big push this weekend, and maybe even finish by Monday. 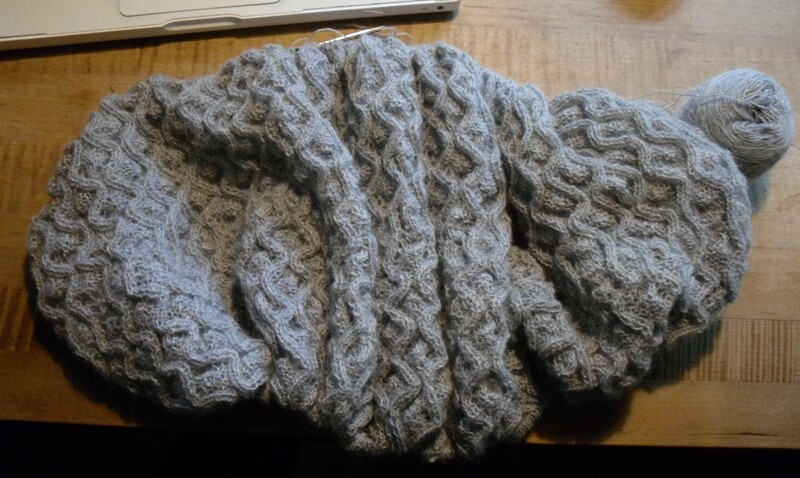 This project has really shown me how bad a test knitter I would be. I can barely follow my own pattern without changing something! I’m still looking for a better name than SiG Blankie, and while I could go with A Study in Blues and Browns, that feels a lot like an artsy fartsy cop out name. While the blanket sort of feels like it wants something whimsical and child-like. This picture could probably simply be copy and pasted into knitting updates about Icy Fields for at least the next month, if not the next two months. 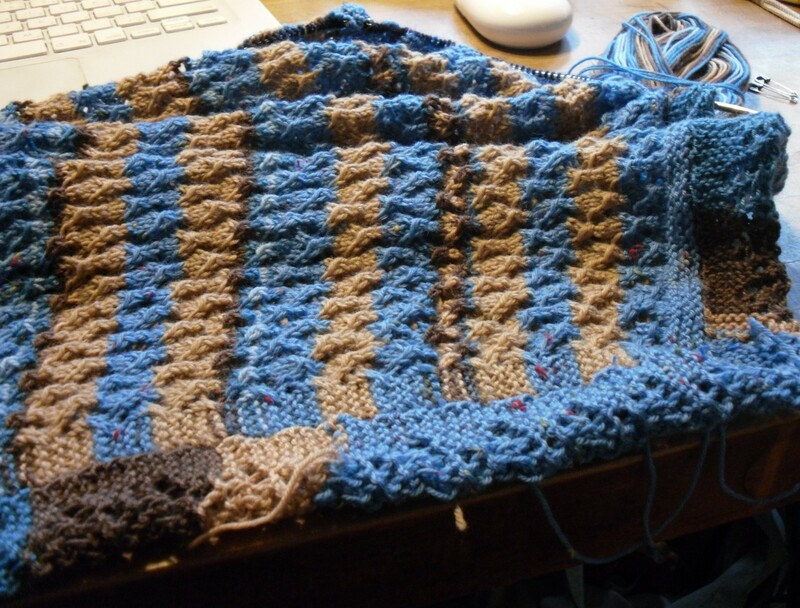 While I’m less than 50 rows away from being done, each of those rows has about 1,100 stitches in it. Sigh. 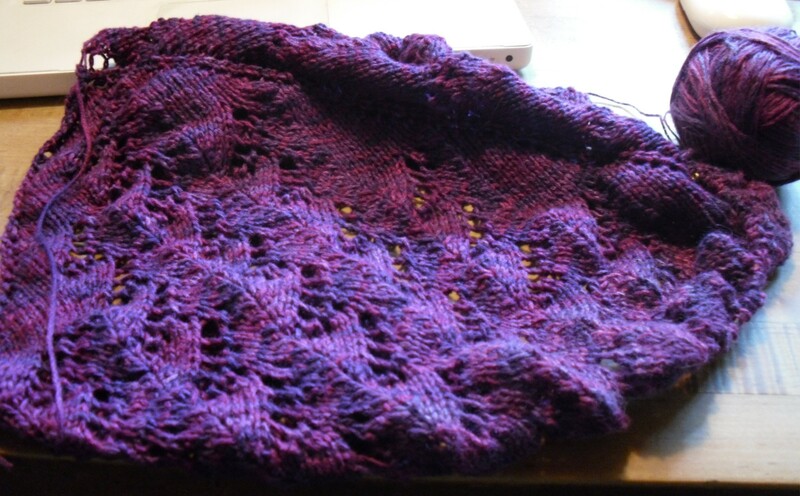 The problem with the shawl right now is that it takes about the same type and amount of effort and concentration to work on as the blankie, but the blankie has a deadline. So Icy Fields gets put on the back burner. I’m thinking that once the blankie is done I’ll put a conscious effort into working on this project, rather than simply picking it up and doing a handful of repeats every few days or so. I’ve decided to split this update into two parts, because of how long it has become. Part two, covering the pattern writing and an update to my modified 10kH will be published tomorrow, maybe the next day.